The Four Pillars of Paying For College | Passive Income M.D. 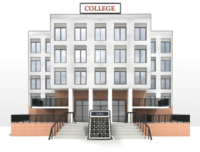 The four pillars to Financial-Aid Planning for Physicians with college bound students are; 1. School selection, 2. The child’s contribution, 3. College savings, 4. Your current earnings. There is no pillar called debt. There is little reason for any student to have student loans when finishing a bachelor’s degree, especially the child of a physician. College education for the children of a physician should not be a terrible financial stress and should be easily doable on a physician income.